Amino Acids are the basic building blocks of proteins and enzymes and are essential for normal healthy bodily function especially during growth and convalescense. The essential amino acids cannot be made in the body and must be included in the diet or as a supplement. Aminomin is used as supplement in the treatment of conditions associated with deficiency of certain vitamins and amino acids, such as severe infections, degenerative diseases, endrocine dysfunction, surgical procedures, injuries, burns old age, beri-beri, riboflavinosis or pellagra, Dietary management of urea cycle disorders & nutritional supplementation. – An inborn error in leucine metabolism can lead to ‘maple syrup urine disease’ This is generally seen in infants and result in retardation. – Increased loss e.g. diarrhea, burns, blood loss. 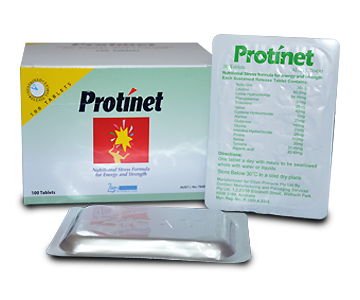 – For enhancement of host defense during convalescence from surgery or chronic debilitating conditions. Contraindications: Aminomin is contra-indicated in patients known to be hypersensitive to any of its components and in patients with hypervitaminosis. Adults: 15ml (One Teblespoonful) twice a day or as directed by the physician. Children: 2-6 years: One Teaspoonful (5ml) 1-2 times a day or as directed by the physician. 6 years & above: One Teaspoonful(5ml) 2-3times a day or as directed by the physician. Adverse effects are rare. But can cause allergic reactions, skin rashes and gastrointestinal disturbances such as nausea, vomiting and diarrhea or constipation. Aminomin is not recommended for the treatment of severe deficiencies of vitamins. In such cases the underlying cause should be determined and corrected if possible. Aminomin is not intended for the treatment of pernicious anaemia since neurologic involvement may develop or progress despite temporary remission of anaemia in patients with vitamin B12. Problems in human have not been reported with intake of the normal daily recommended amounts. Many drugs have been reported to interact with vitamins. Most of the interactions indicate that many drugs render different vitamins ineffective by interfering with their absorption, by stimulation their metabolism or by increasing the rate of their excretion. For example, clofibrate a drug used in heart trouble decreases the absorption of Vitamin B12.